Already, in Rushmore, you could sense that Wes Anderson felt a nostalgia for world-historical sufferings he hadn’t endured. It’s not an uncommon imaginative kink among the more privileged Americans of his age group, the ones who reached adulthood in the safely self-involved years between the demise of the Soviet bloc and the start of the “war on terror.” In the novels of Jonathan Safran Foer—those reconstructions of the twentieth century’s Top 10 enormities, done in a mode of sighing whimsy—you may find one example of an artist of this generation measuring his ease and cleverness against the horrors of the past. Another example is Rushmore, where a 1990s prep-school boy idealizes the Vietnam War as a test of manhood that he will never get to pass, and a thrilling adventure (known entirely from movies) that he can re-create onstage. In Rushmore, at least, this longing for one’s own private Tet offensive was not a generalized condition, but the trait of a single decidedly immature character. Something similar might be said of The Royal Tenenbaums, in which a drug-addled novelist, who has faced no greater challenge in life than going to bed with Gwyneth Paltrow, tries to turn himself into a buckskin-clad facsimile of George Armstrong Custer. By the time Anderson got to Moonrise Kingdom, though, his disappointment at having missed all the good bloodbaths had leaked out of the character and into the movie’s atmosphere. It did so charmingly, of course, with a becomingly modest if highly detailed sense of play; but when a Boy Scout came onscreen dressed and outfitted like a nineteenth-century frontiersman, it was clear that Anderson was now doing more than delineating an individual. He was evoking a desire that’s in the air, a half-embarrassed, half-guilty wish to know something of the great convulsions of the past, if only in the form of miniaturized romance. In that spirit, the first thing Anderson does in his new movie, The Grand Budapest Hotel, is go back in time, from frame story to frame story, as if to acknowledge how far he stands from his main characters, who live amid the rising fascism of Central Europe in the 1930s. The last thing Anderson does in the movie does is collapse that temporal distance abruptly, as if snapping shut a telescope. You’re in a film ruled by incongruities of space and time, in which you jump from the toylike, flat animation that provides the first view of the Grand Budapest Hotel, high in the mountains of the fictitious nation of Zubrowka, to the perspectival vastness of the hotel’s lobby, which looks as if it could swallow all of Last Year at Marienbad (except that Marienbad was shot in wide-screen, and Budapest mostly uses the squarish format of 1930s films). Anderson cuts from the absurdly coffinlike dimensions of an imperial-red passenger elevator, barely big enough to hold four people if they don’t breathe, to the equally absurd expanse of a dining room where a party of two is surrounded by an acre of empty tables. He juxtaposes the prisonlike confinement of a hotel employee’s room with the vertiginous grandeur of a real prison; he contrasts the doll-size quarters occupied by a pastry-shop assistant—in the Central Europe of myth, all cream-filled shells are works of art—with a castle’s cavernous hunting-trophy hall, which is as big as all outdoors. Above all, Anderson plays with the incongruities of age, size, personality and acting craft of his two principal figures: the concierge of the Grand Budapest Hotel in its heyday, Monsieur Gustave (Ralph Fiennes), and the hotel’s novice lobby boy, Zero Moustafa (Tony Revolori). Middle-aged and teenaged, tall and short, worldly and naïve, overbearing and eager to please, Gustave and Zero are the latest in Anderson’s line of morally questionable older men and the intelligent lads they instruct. The mentor in the current pair is distinguished by his round-the-clock evening wear, sleek silhouette, gigolo’s manners, and habit of either making grand pronouncements on trivial subjects or dismissing grave matters as trivialities. (There again you have the contrast in scale.) It’s difficult to think of an actor other than Fiennes who could have made Gustave so drawling and yet quick-tongued, so self-dramatizing and yet (despite himself) endearing, so that you wonder if this nobody from nowhere had taught himself to pass as a gent by studying recordings of Noël Coward. Now Zero studies Gustave. 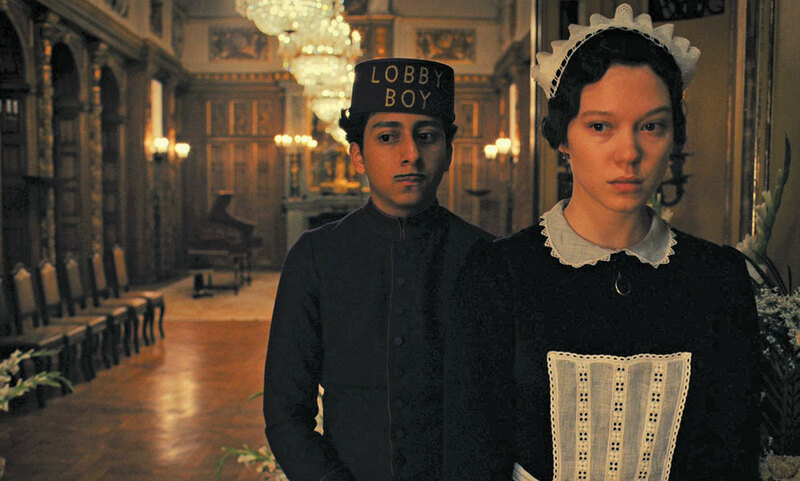 Dressed in a painted-on mustache and a pillbox hat labeled “Lobby Boy” in enormous letters, Tony Revolori looks like someone whose whole life is two sizes too big for him, and copes with the problem by maintaining the earnest deadpan that is standard among the protégés in Anderson’s films. Against Fiennes’s virtuosic flourishes, Revolori is allowed to deploy little more than an occasional sidelong glance, as if he’d been told he could watch his great co-star’s performance only out of the corner of his eye. He’s a faultless straight man. But what do these two actually do in The Grand Budapest Hotel? Thematically, they live through Europe’s last days of waltzes, schlag and fluttering old countesses. Literally, they chase through Anderson’s elaborate sets and the wintry landscape, pursuing a large windfall for Gustave and being pursued by the people who don’t want him to get it: a protofascist aristocrat (Adrien Brody) and his motorcycle-driving thug (Willem Dafoe). This plot is wholly inadequate to the subject, and Anderson knows it. In fact, he planned it that way. Anderson’s goofy dream is of course closest to Bottom’s version of inexpressibility. With great panache and an almost imperceptible wink, he serves up witty confections of sets, costumes and acting that are as deliberately mismatched to the terrors of this history as is Zero to Gustave. This is the film’s ultimate incongruity, meant to amuse and touch you while keeping Anderson honest about his firsthand ignorance of fascism, war and a half-century of Soviet dreadfulness. But by the time he decides to kill a few minutes by sending Gustave and Zero barreling down a winter-sports competition course—the closest thing that Universal Studios will ever find to thrill-ride potential in a Wes Anderson film—the fun has begun to wear thin. By the time he has Zero recall, in voiceover, that one of the people close to him died of “the Prussian grippe,” the fun, too, has died, along with any hope that Anderson has a grip on his material. He has attributed the inspiration for The Grand Budapest Hotel to a bout of reading Stefan Zweig. Other points of reference that he cites are Hannah Arendt’s Eichmann in Jerusalem and Irène Némirovsky’s Suite Française. To the best of my knowledge, he has not mentioned another work that might have been a useful model, Jiri Menzel’s I Served the King of England. If you’ve seen that movie, you will know that it’s possible to tell about the grand sweep of events in Central Europe from the point of view of someone small, hapless and servile; that lightness of touch, and broken-hearted laughter, can be perfectly appropriate to this subject; and that when a fancy, self-important maître d’hôtel chooses to defy the Nazis to their faces, it really can seem like a brave assertion of civilized values. It just doesn’t seem like that when Monsieur Gustave does it, despite Wes Anderson’s best hopes. In making I Served the King of England, Menzel had this advantage over Anderson: he lived through some of the history he showed. The author of his source novel, Bohumil Hrabal, had the terrible luck to have lived through all of it. I don’t say this to belittle Anderson, a wonderful artist to whom I owe some of my best movie experiences of the past years; nor would I disparage the desire to think one’s way into the lives of people in other times. Even when that project entails a bit of pilferage, with the moral coin of suffering making its way, unearned, into the wrong pockets, I think it’s much better to acknowledge past horrors than to ignore them—especially these days, when entire polemical industries are devoted to denying that anything bad happened at all. Still, I’m bothered when an overabundance of surface effects (again, I think of Jonathan Safran Foer) covers up a ringingly hollow purpose, containing very little except authorial will. So I turn for contrast to the new documentary by Rithy Panh, The Missing Picture, which carries with it such a burden of personal and collective pain, and bears reliable witness to such a huge historical crime, that I’m almost ashamed to add that it’s inventive, imaginative, beautiful and at times even charming. Born in Phnom Penh in 1964, and forced at age 13 into a Khmer Rouge slave labor camp where he saw his family die, one by one, Panh has previously made strong but fairly straightforward films about the Pol Pot regime. Perhaps the best known is S21: The Khmer Rouge Killing Machine [see Klawans, “Band of Insiders,” June 7, 2004], which foreshadowed Joshua Oppenheimer’s method in The Act of Killing by having the murderers re-enact their deeds on-site. From S21, you could have known that Panh is an elegantly thoughtful filmmaker who respects both the trace of reality in photographic evidence and its mute incompleteness. You would not, however, have been able to predict the flood of imagery (the metaphor is Panh’s) that hits you in the face in The Missing Picture, nor the pathos with which he substitutes intimate, handmade scenes for realities too large or too awful to represent. One last incongruity of scale for present purposes, one last confrontation with the inexpressible: in The Missing Picture, Panh re-creates his life in the Khmer Rouge camps through the use of painted dioramas, populated by innumerable carved clay figures small enough to fit in your hand. It’s a toy genocide, complete with little boxcars and tumbrils for the victims, barracks, machine guns, loudspeakers, dogs, water buffalo, bicycles, flags and cooking pots (not that there’s much to cook). Interspersed with these images of dolls being worked and starved to death are segments of Khmer Rouge propaganda films showing the glorious leap forward of Democratic Kampuchea. Look closely at the footage, as the film’s narrator observes in voiceover, and you will see facts that don’t support the slogans—wraithlike children staggering under the weight of their labor, for example—but were inadvertently memorialized all the same. In the film’s language, these pictures are not missing. The dioramas, on the other hand, testify to experiences for which the pictures are absent, or rather exist only in Rithy Panh’s memories—memories that he would like to get rid of by showing them to you. But that’s only half the story. Panh also has missing pictures that he cherishes: scenes that he re-created because he wishes he could go back and dwell in them. These are his recollections of the family house in Phnom Penh, with schoolwork at the kitchen table, dinners in the courtyard with the aunts and cousins, and rock-and-roll dance parties where his brother played guitar. I don’t think it’s too much to say that Panh’s loyalty to this lost world of childhood is something he shares with Wes Anderson. Both of them are drawn to the emotions of a vanished boyhood, which they see as idyllic and doomed. Both dramatize adult situations through methods that accord with a child’s feelings. The difference between The Grand Budapest Hotel and The Missing Picture is that Anderson retrojects his reveries of childhood into a Ruritanian neverland, whereas Panh carries his forward into the Cambodian nightmare he was actually forced to endure. And if you didn’t know Panh’s biography? You would still recognize The Missing Picture, for all its fancifulness, as the real thing. It begins its US theatrical run this month, at New York City’s Film Forum and elsewhere.